Because the BATA-2 pitching machine weighs nearly 100 pounds, it is not the easiest thing to move around. Why make things harder than they have to be? 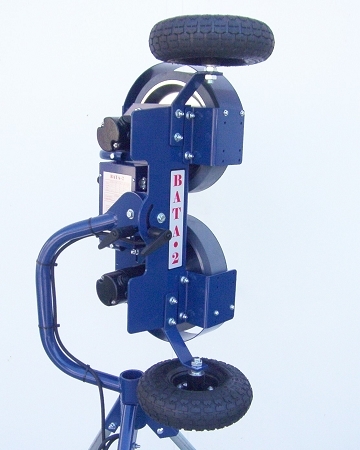 The BATA Transport Wheels Kit for BATA-2 Pitching Machines allows you to move your pitching machine easily from place to place. 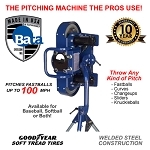 Easy to attach and not only great for moving the machine from your vehicle to the field, the BATA-2 Transport Wheels kit makes it possible to pivot the machine from pitching mode to other parts of the field for fielding practice without a struggle. No matter where you order a BATA-2 Transport Wheels Kit from, NOBODY actually stocks them; they all ship directly from the manufacturer's warehouse located in Redmond, Washington. Therefore, the shipping time frame is exactly the same no matter what website you order from (we hope that it is this one!). BATA-2 Transport Wheels Kits typically take 5-7 business days to ship from the time you place your order. They ship via FedEx Ground and could take anywhere from a day or two to a week to get to you AFTER being shipped, depending on your proximity to their warehouse. We will notify you of your tracking number the moment we receive it from the manufacturer's warehouse.